The 4 in 1 wireless module integrate four RF chips (CC2500,NRF24L01,A7105,CYRF6936) into one single circuit board,with MCU baseplate,can support a variety of remote control protocols by identifying the PPM signal output of the remote control,such as Walkera DEVO,Spektrum DSM2,Flysky,Frsky,WLToys,Hubsan,Hisky,etc. It can control up to several hundreds airplanes (or receivers). This module can recognize the remote control PPM signal, then converted into the corresponding standard wireless remote control format,which means that in theory as long as the remote control is with analog functions, it can work. But this item didn't come with a housing,so you will need to solve the housing problem. 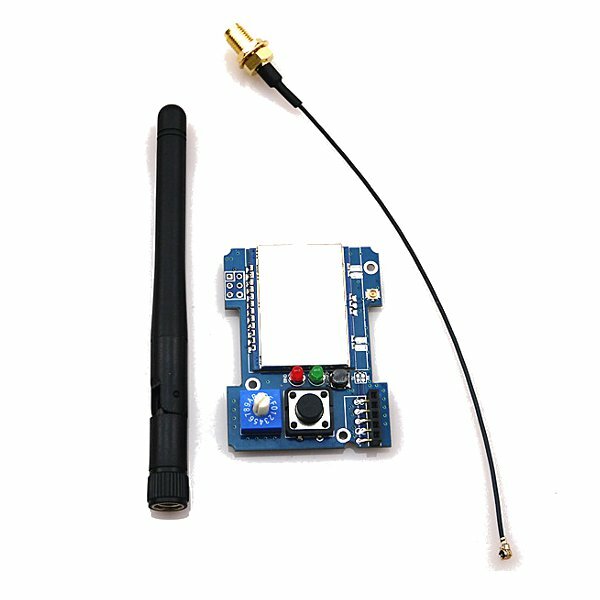 This product includes the wireless module and the MCU baseplate. The wireless module is responsible for transmitting and receiving 2.4G wireless signals,the MCU baseplate is responsible for processing data and implementing remote control protocol,they should be used together. The module version depends on your transmitter brand,if your transmitter brand is JR,then please choose JR version,the Flysky version is specially for Flysky TH9X transmitter,the other brands transmitter can choose Frsky. The above protocols are transplanted from open source projects based on the remote control Walkera DEVIATION,the the original author have tested almost the protocols,but he is not specially test for this 4 in 1 wireless module,the protocols our supplier tested have been stated above,untested protocols does not rule out is not supported,but there may be a problem of program configuration,so not rule out the subsequent firmware can support. - Part program version DSM2 have protocol compatibility problems. - Some receiver (original AR600) need to rebind per use,some receiver (Spektrum integrated receiver) frame rate is a bit slow. This issue basically determine the problem is on the program itself. CC2500: V8FR receiver with Frsky protocol,about 240m. A7105: WLToys V911 helicopter with Flysky 8 ch receiver,based on Flysky protocol,about 240m. NRF24L01: WLToys V977 helicopter with KN protocol,use Walkera DEVO transmitter,about 200m (If equipped with MCU baseplate,only 50m). Hisky HCP100S helicopter with Hisky protocol,about 70m.